We just wrapped up this year's MixCoach Experience Weekend and are still buzzing from all the fun we had with our attendees! If you haven’t heard, every year we host a three day event and workshop where we spend time hands-on with attendees teaching all of the things that can’t be taught online in a course or in monthly training on MixCoach Pro Member. The best part is that we get to hang out with you guys, MixCoachers (our followers) from all over the world, getting to interact directly, covering the questions and topics our attendees are interested in. This year we spent some time in Music City (Nashville, TN) recording and mixing. On Thursday we got together with all of our attendees for a fun “Meet and Greet” night at a great restaurant in Nashville. Friday, we spent the entire day in a studio recording a song from scratch, written by Kevin, featuring one of Nashville’s best session musicians, Brent Rader. Brent is an incredibly talented multi-instrumentalist who played all of the tracks, allowing us to see inside his workflow as he worked out parts and played them live with Kevin producing, and our attendees engineering the session. Saturday, we spent the entire day hanging out with Joe Carrell at his studio, where he showed us inside his mixing workflow, mixing the song we recorded just the day before. Later on Saturday, attendees had the opportunity to open a song/session they had mixed and discuss it. Things like, how they got that awesome drum sound, as well as how things could be improved. As always with the MixCoach Experience Weekend, the best parts are what happened between the planned topics. All of the conversations that happen "off camera" over lunch, dinner, or after the sessions end, are where the most valuable information is learned. If you weren’t able to make it this year or if this sounds like something you want to attend in the future, you are in luck! 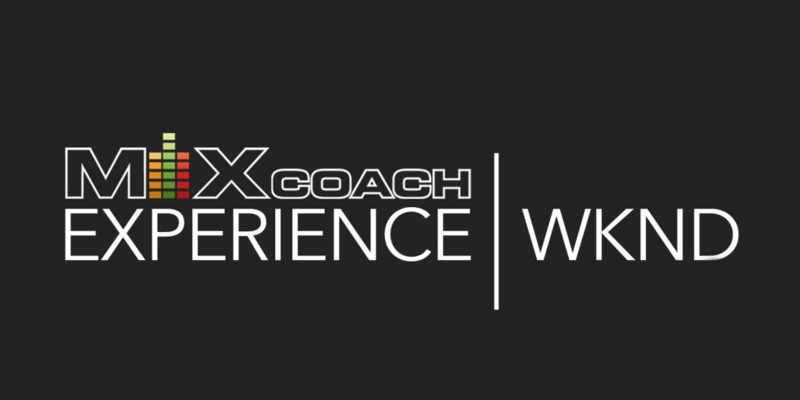 We are planning another MixCoach Experience Weekend for 2018, and it’s just around the corner! We are planning to host this event for the first time in beautiful southern California March 15 through 17, just 5 months away! If you are interested in learning more about the event and staying in the loop as we finalize details, please keep reading to find out how! We are deep in the planning of the event, but always try to cater the content around what attendees want to learn. So the earlier we've got you down, the better! We need YOUR help to reach our goal of ONLY 50 PEOPLE INTERESTED in order to make this event a reality. Because we are still planning the event, we would LOVE to hear from you about what topics you would like to be covered at the event to better custom tailor it to what YOU want to learn. Once we reach our goal we will be giving away a FREE course from this years event as a thank you for your interest. Help us reach our goal by ﻿﻿﻿SIGNING UP HERE﻿﻿﻿, and stay in the loop as we finalize details for the MixCoach Experience Weekend 2018. As a bonus, receive a FREE course from our last event (once we reach our goal). Copyright text 2018 by MixCoach.